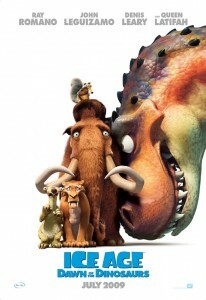 ‘Ice Age’ has been good to Fox Studios and serviceable to audiences. 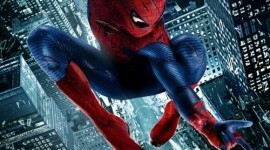 The first film was solid entertainment, the second installment a major bore, and the latest entry again decent. That’s the best compliment I can give it. As a distraction for kids, ‘Dawn of the Dinosaurs’ is better than ‘The Meltdown’ for a few reasons. The storyline is stronger. Sid (John Leguizamo) stumbles upon three seemingly abandoned eggs beneath the ice surface and takes them to raise as his own. Out hatches three baby dinosaurs and they wreak havoc for Manny (Romano) and Ellie (Latifah) who are expecting their first youngin. When Mama T-Rex comes back for her three babies, Sid is whisked away to a jungle world beneath the ice and it’s up to Manny and team to bring him back with the help of newcomer ‘Buck,’ (the one character that doesn’t work) a swashbuckling, dinosaur-hunting weasel on a continual quest to bring down the greatest dino of them all. The second pro: it seems as though more screen time was given to Scrat the squirrel and a new sub-plot involving a romance with Scratte, his female counterpart. Scrat’s scenes have always been the best in the series, and it’s proven even further with this sequel. Final pro: Yes. This one’s in 3-D – and not a pointless 3-D. This is where 3-D sells an otherwise average movie. Pixar’s ‘Up’ didn’t need it. ‘Ice Age 3’ really puts it to use and blends the splendid animation with a surrounding landscape, and it all comes together very well. If you’re at all interested in seeing it with those goofy glasses on, more power to you — this is a strong selling point for the movie. And, at the end of the day, I have to recommend this. It works far better than the last movie, and there’s worse animated fodder that has been released in the past. The movie is short, lively, superbly animated, in a strong 3-D format, sporadically humorous, and a solid choice for kids. No, it’s not quite as good as ‘Up.’ It’s not Pixar. But what else is, really?